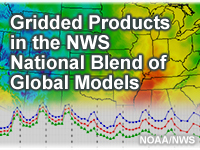 This lesson introduces users to the five different guidance products that will be included in Version 1.0 of the U.S. National Weather Service (NWS) National Blend of global Models (NBM). The primary audience for this lesson includes forecasters and users of NWS forecast products; some prior knowledge of numerical weather prediction is useful. Learners will explore how model guidance from the Global Forecast System, Global Ensemble Forecast System, Canadian Meteorological Centre Ensemble, Ensemble Kernel Density Model Output Statistics (MOS) and gridded GFS MOS is produced. The strengths and limitations of interpolation processes will also be discussed. Good general overview. Know your acronyms going in. This lesson was as interesting as watching pain dry. The information was important, but presented in a manner to be difficult for a non-modeler to understand. could use more visuals, flowcharts are okay, but that kind of info never sticks in my head long-term. course quiz was hard! I would recommend some audio to reinforce important points. It is rather boring to read slides almost exclusively. Prefer to have an instructor presenting and explaining the material. Information in this module was a bit more in depth than probably needed for the operational meteorologist. good information, although the wording of some of the quiz questions was a little confusing...mainly the T/F questions about the MOS. A well thought out and put together lesson relevant to my everyday work duties. List the five different products used in the Blend. Describe the model type, resolution, assimilation scheme, and number of daily cycles for each model used in the Blend. Explain how the model guidance is interpolated to the grid level using gridded MOS and EKDMOS. Explain the strengths and limitations of the MOS. numerical weather prediction, models, blend, grids, ensemble, model output statistics, EKDMOS, GMOS, NWS. Two new direct model output sources have been added for version 2 of the National Blend of Global Models (NBM): the North American Mesoscale Model and the North American Mesoscale Model Nests. These two sources provide additional data for Blend forecasts of various weather elements across different domains. Updated details of forecast frequency, resolution, data assimilation technique and other features for all direct model output sources are described. Future developments to improve the Blend and expand its suite of forecast elements are discussed at the end of the lesson.